Anyone wanna help with contributing patches, combinators and skins, and content organization? After 30 posts in this thread, and many great contributions, I plan to maintain this first post as a repository for the submissions. Please continue to submit patches. 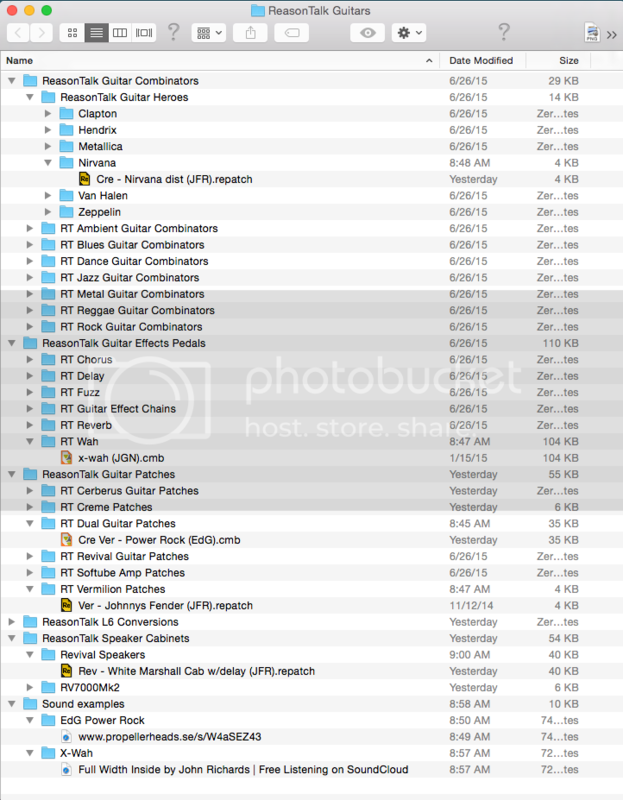 Dirk's (Eusti's) idea is for Reason guitarists to take these guitar patches and organize them in their own folder/file system so they are easily accessible in the browser. Below is a suggestive folder layout that I use, but feel free to set up one however you need it for your workflow. After 69 posts in this thread (a truly honorable number), and lots more good stuff, I realize that this thread can simply be the place to post patches forever, and the ones posted in this first one can just be a few examples. Last edited by jfrichards on 02 Mar 2017, edited 28 times in total. Where how / do I upload this Kuassa combi I made ? @GeiddE: Maybe zip it up before? thanx…. last link says this"You do not have the required permissions to view the files attached to this post."…. but why? eusti wrote: @GeiddE: Maybe zip it up before? Last edited by GeiddE on 19 Jul 2015, edited 2 times in total. ^ Seems to work now! As I made these patches I often used Accoustic Guitars (NN-XT) and the Elec 12 open to see if these are in check. 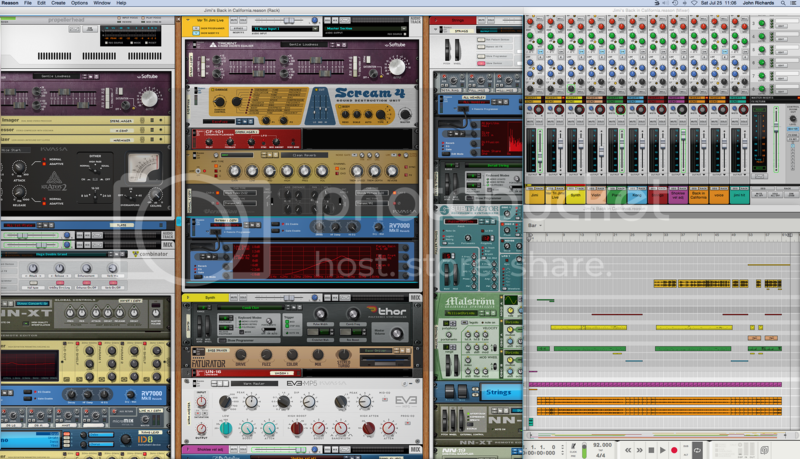 They may react a bit different when you would for instance use these effects as an insert for audio tracks. Also, the idea I was going for is a "creative" effect rather then a series of straight forward "scream 4" / "pulveriser" setups. So expect some creative sounds coming from them. I also categorized them a bit so they are easy to take apart. The insert effects should be R6.5 compatible (since I am not using any REs in these). Heard a contrib and it sounds spooky-rock ! You don't need Trident to run it, use any EQ to bump up the 3K range, by +3 dB, wide curve. As a guitarist you really need Chenille in there, John. Given the use of RE EQs, I'm actually rather surprised you're still using that old CF-101 Chorus/Flanger, as it never sounded good at all due to the near-square modulation shape: it just leaves it will a highly artificial sound, imho, a strange square-vibrato. Replace it will Chenille's "Orbitone 310U" patch for a pychadelic, Leslie-like spacey chorus; one of the Dimension Modes for smooth non-modulating richness (might need to rack up the Dry/Wet to 50% or more, not what I recommend for vox, but for guitar it'll be fine), or the "GUITAR - CE-1 Chorus", which I think is the type of sound I think you were aiming for, a wide chorus but with a hint of modulation. The Combi sounds quite cool with the "GUITAR - Univibe" patch too. Hey Matt, I found some great tones in Chenille when I tried it out. Couldn't buy it at the time, now it's number 5 on my RE wish list and money is getting tighter unfortunately (the only drawback of retirement). If you could add a couple of your favorite Chorus patches using Chenille, and make teeny sound clips for them or links, I'd love to add them into the Chorus section of this project. Here's 9 FX Combi's from 3 of my guitar tunes. All I've done is cut them from the audio track insert sections and then pasted, recombined and reattached in/out cables. They all expect mono guitar input and all give stereo output due to sims or stereo fx used. They use a lot of REs, all use RE-2A for example but substitutions could easily be made. My guitar output signal is quite loud so (as you would anyway) you'll probably have to adjust the dynamics and probably EQ settings. I am so grateful for this thread. I am waiting for my new computer which should let me play through all these wonderful patches without crackling! Last edited by sdst on 15 Aug 2016, edited 1 time in total. Just found these four combis from Carnstein using Creme and Echobode. I'll try to work on them to fit in the ReasonTalk guitar folder. He has dropbox links to all four and says most of it can be done with the Reason delay.